They are the largest member of the deer family in the world and the largest land based mammal in Europe. Today they are very unique compared to other deer - especially the nose, while his predecessors still looked like deer (please check section "History" for more information). 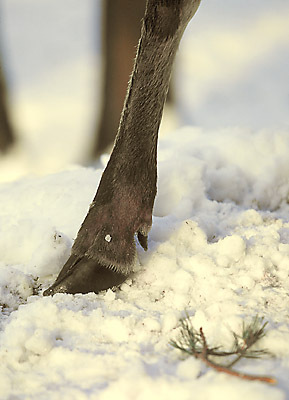 Moose are long-legded (100cm) to easily step over logs and bushes as well as master deep snow. They have a hump around the shoulders, which comprises of ligaments attached to the neck vertebrae for holding the huge head upright. The head itself is big and nearly as long as the neck, which is packed with muscles, which mainly the bull needs to hold the head with the heavy antlers upright. They have an overhanging muzzle, the long, soft and sensitive lips with cartilage are made for analyzing and slipping off leaves from branches (and give them a glance of stupidness). Also nicknamed "muffle", likely derived from the French "muflet/mufle ("an animals's muzzle"), which again originates from the German "Muffel". The nose is extraordinarily complex in anatomical aspects of muscles (for the flexibility and mobility) and nerves. 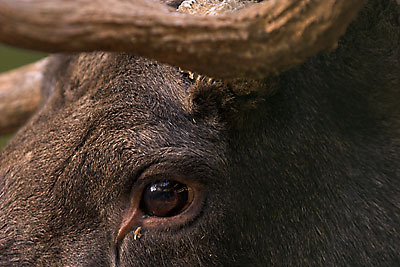 The muzzle is equipped with tactile hair, which the moose uses for selecting twigs and leaf. Channels in the muzzle allow swallowing below water, which is unique for deer (the exact functionality is not researched yet). On the muzzle moose have a small triangular, naked spot below the nostrils, as you can also see on the picture to the right. For information on the antlers refer to the section "Antlers & Fight"
A growth of hair and skin is hanging from the throat, called a bell or dewlap. Both male and female have one, while the female's one is smaller. It usually has a triangular form : a bag with a rope at the rear. The bell reaches its biggest magnitude at around 3-5 years of age. It is used for the purpose of smell dispense (scents from the bulls urine and saliva containing pheromones are dispensed with the bell during mating season) and visually (size and shape is sexual indicator) for communication. The size varies by age. The Indians (Iroquois) called the bell "Mousomodai" meaning "moose bottle". The body is relatively short, but massive and square, while the back part is decreasing. The form is optimized to conserve the body heat - essential in the cold habitat moose are used to. The tail is very short and nearly not visible. White moose are a very rare color variant - they have dark spots in the hair, dark eyelids and a dark nose. Those moose are not albinos ! In general the coat (guard hair) is relatively long (usually 10cm, up to 25 cm mainly at shoulders and neck), hard, harsh and slightly curled. The hair is air-filled for better insulation in winter as well as better swimming capabilities. Additionally a fine undercoat of grey wool grows thicker before winter and the guard hair gets reinforced by longer, brown guard hairs. The coat is changed every year around April-June. Equipped with up to 18 cm long toes, which they can spread wide, they are prepared to walk on marshy ground. Their cloven hooves are split into two digits connected with the interdigital cleft. This skin between the digits can be stretched by spreading the digits apart - allowing for a larger footprint area - just a man walking with snowshoes. Bulls imprints are bigger and wider than that of cows, also the steps are wider and can be up to 3,50 m apart when jumping. The distance between the toes is about 11-12cm. Behind the main toes moose have small dew claws. They only get visible on the footprint - as you can see it on the drawing - when the moose is going with fast speed. In normal walk the footprints show only the two main toes. Moose have two different types of glands at their feet: At all feet they have glands to leave traces of fragrance. 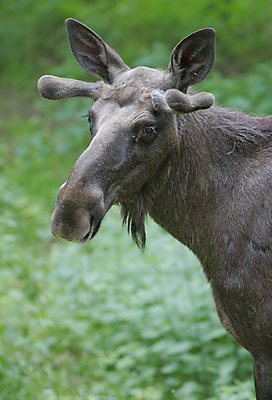 The other type is only on the back feet and is used to warn other moose in hazardous situations with a Pheromon. Moose can get up to 3,50m long from head to tail (usually 2.7 to 3 m) and weigh more than 500 kilograms (average) - up to 825 kg have been noted. Peak weights are measured in an age of around 10 years. The tail reaches 7-12 cm only, the bell can be as long as 50 cm. The shoulder height can be more than 2,40m , but is usually about 2m. Cows are around 20% smaller than bulls. Moose can get 27 years old in captive conditions, although most only reach ages of 5-12 (sometimes 16, longest known 22) years in nature. Cows in average get older (20 years) than bulls (15 years). One assumed reason for the limited life time is the wear of the teeth when getting older - making it harder to eat enough for survival. Other main reasons for this limited life expectation can be found under " Threats, Competitors and Damage"
How to find out a moose's age? Check his teeth (usually done on the middle incisor teeth): A dark ring combined with a more pale ring counts for one year each! The brighter part grows in summertime, calves are born in summer, so the inner part of the the tooth starts with a bright area. 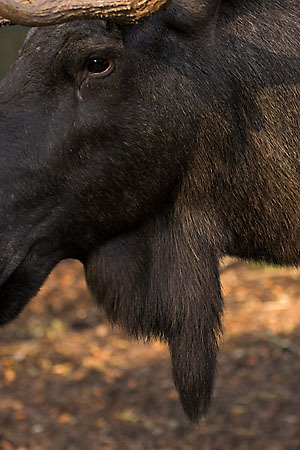 Another way described: A moose get's his final, adult set of teeth with 19 months of age. Now it takes around 8 to 9 years, until the molars get a smooth surface due to abrasion. Conclusion: When a moose's molars get a smooth surface, the moose is approximately 8 to 9 years old ! Moose have 32 teeth - 12 molars/premolars both in the upper and the lower jaw and 8 incisors only in the lower jaw, where the upper jaw has a hard, unsensible "plate". The highly mobile and large ears, around 25-35 cm long, can rotate to detect any sound from any direction - it's working like a very sensible, directional microphone. Each ear can be adjusted in another direction, it detects sounds from 16 to 21000 Hz with a focus on lower frequencies, which can beat long distances in the forest - up to 3 km. They use this as means of communication especially during rut ! It is assumed, that also the palmated antlers are utilized as "dish antennas" for additionally improving the sensitivity. 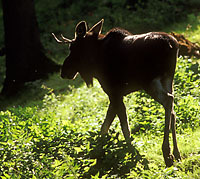 Moose have a variety of sounds to offer: Cows grunt and can produce a wailing sound during rut. Bulls produce intermittently grunts every 5 seconds during rut. Calves can utter grunts, whines and squeaks. 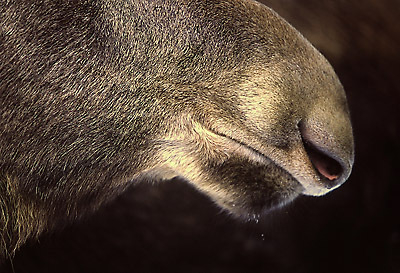 The nose is highly important for the animals, as most of moose's communication works on smell. Additionally he of course finds food and detects threats with the highly developed smell sense. The nose works both in forward as well as in reverse direction, the high quality derives from the huge total smell surface area of around 800 cm² and the high densitiy of sensory receptors - 200 times more than that of a human and still 4 times that of a dog! Additional moose have another smelling area on the palate (the Jacobson's organ), which is dedicated for reasons of rut - mainly important for bull moose, as they can detect fragrances cows secrete when they are ruttish. The eyes - only 4 cm in diameter - only gives a moderate sight to its owner - they can't see very far, and additionally they cannot distinguish red and green. Moose have many detectors for black/white viewing, but very few for colour sensing, giving them a fairly good aid in the dark/twilight, which is gainful for his main active times. And he can also see to the back, as the eyes are at the heads side. Eyes additionally can be controlled independantly ! 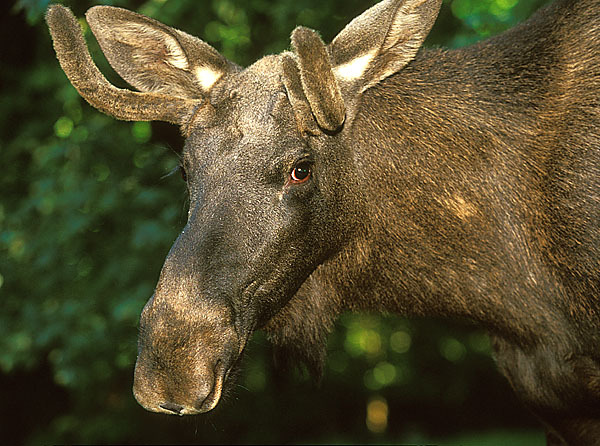 With their oval pupils moose can only either see the area around their front legs by bowing their heads downwards OR to the front when holding the head in normal position- a hard limitation. The moose - as other night active animals - has a mirror (tapetum lucidum) in the back of the eyeball, sending incoming light a second time through the retina. The mirror is also what gives the spooky view when car lights catch a moose standing at the roadside. Moose are not capable of recognising motionless objects, but detects any movement immediately and usually react with escape. Everybody knows horse - maybe the size of a moose can be easier "felt", if we oppose horse and moose with their major dimensions. For this comparison the average measures of a "normal" horse (equus caballus) are chosen, not those of the cold-blooded ones being more heavy. As the variance of both species is enormous, the comparison can of course only be a hint.